2 Digital Ocean droplet:- One droplet is to run snapshot automation script 24*7 and another droplet is the digital ocean server which you need to take snapshot automatically. Dosnapshot Script:- This is the script which we are going to use to take digital ocean snapshot automatically. I hope by this time you already have 2 test digital ocean droplet. Now we need to get digital ocean “Personal Access Tokens”. In the Next Step you are going to get Personal Access Tokens to your Digital Ocean account. Copy and Keep it on somewhere safely, because you are not going to see that again. So now we have Digital Ocean Access Tokens with us. Before we start it, Lets understand what the server name points to which server. In the below image you will see 2 servers. One is Server-to-Backup and another is Automation-Script-Server. Server-to-Backup: This is the server to take automated snapshot on scheduled timing. Automation-Script-Server: This is the Server to which runs digital ocean automated snapshot script (DoSnapshot). In this tutorial mostly we will deal with installing and setting up of DoSnapshot script, so open 2nd server i.e., Automation-Script-Server on SSH. Dosnapshot requires Ruby on Rails to run that script. 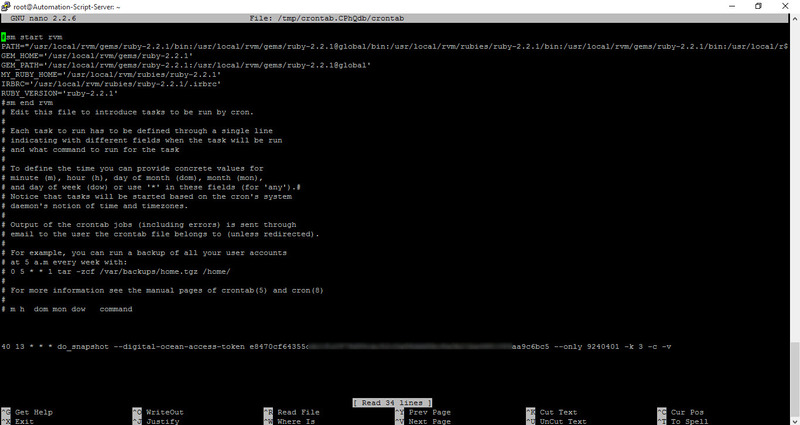 So now we are going to install Ruby on Rails on our Ubuntu Operating system (Ubuntu 14.04.3 x64). so copy the above command and execute it as well. 7. First we will try whether the script works or not by executing below command. 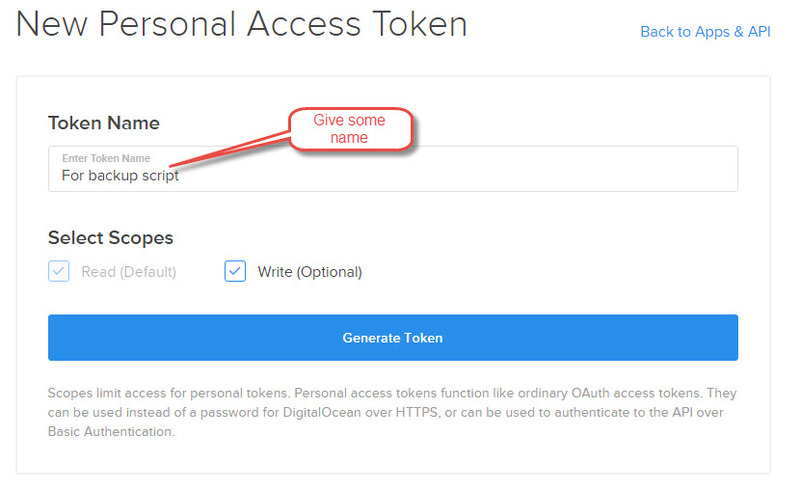 Make sure you replace my digital ocean access token and droplet ID with your’s. If everything works fine, then this script should take snapshot of the droplet ID which you provided in the command. Once command successfully started working manually, now we will schedule cron job to do work for us. Before setting cronjob we need to run two more commands. Execute below commands one by one. once you done that. Open crontab by executing below command. scroll down to the bottom of the page and and place the below command on it. Explanation of the above command. 10. That’s it. From now onwards you server will keep taking automated snapshot as per your scheduled timings. DoSnapshot offers little more options, feel free to experiment with those options if you really want extra options. If you have any doubts in this post, then feel free to post in comments. I will try to help. Give us a try https://backupsheep.com/ with free plan you can create schedule for your DigitalOcean server or volume. So instead of random weekly backup you can setup daily snapshots. You don’t even need your DigitalOcean backups enabled and you can restore snapshots from your DigitalOcean account anytime you want. Sorry. I’m not aware of ruby.